Description: HOLIDAY MUSICAL: Bring the whole family to celebrate Christmas with all of their friends in the Hundred-Acre Wood as Christopher Robin is told about the holiday (not so long ago) when Eeyore lost his tail. Full of enchanting songs and beloved characters, A Winnie-the-Pooh Christmas Tail is the perfect holiday treat to share with your little ones. 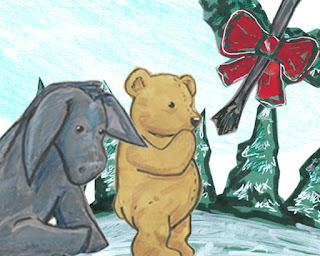 The Story: A very special Friend-and-Relation tells Christopher Robin a story of a Christmas Eve very long ago (about last year) when Eeyore, the old gray donkey who lives by himself in the thistle corner of Hundred-Acre Wood, was absolutely miserable. It seems that he lost his tail and Winnie-the-Pooh and Piglet got all of their friends and a search was organized. There is a great deal of fun and excitement, plus delightful songs, in the adventure that follows.